We have a super school uniform at Ysgol y Dderi at a very reasonable price. It washes really well and makes life much easier for parents. We feel that it is very important that the uniform is worn, especially when we are on outings as it aids the staff in their care for the pupils. The school's uniform is navy and jade. 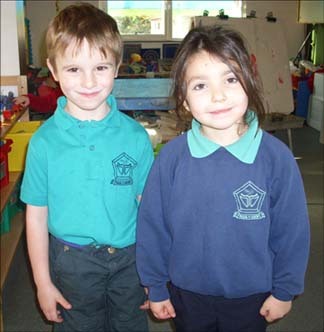 We have a good selection of uniform at school, please call in at school. 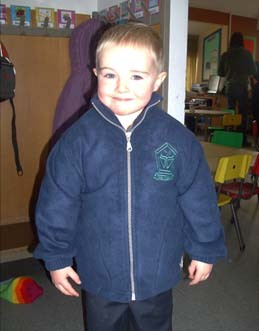 This is our school sweatshirt and polo shirt, worn with grey trousers or skirt. The sweatshirt is navy with the school logo embroidered in jade. They are made from 100% cotton. The polo shirts are jade with the school logo embroidered in navy, and are made from 65% cotton and 35% polyester mix. A winter essential - the school fleece. Navy with embroidered logo in jade. Made from polyester/cotton mix. Also available is a two sided fleece that is both warm and waterproof.